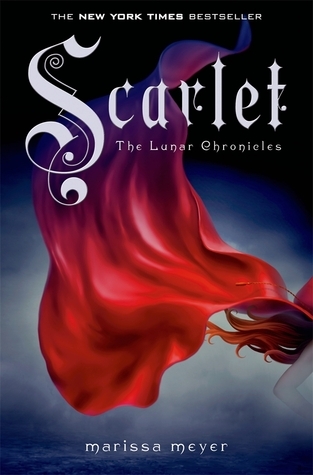 After finishing Cinder, the first book in the Lunar Chronicles series, I wanted to jump into Scarlet. Much like with Cinder, I decided to go blindly into this book. All that I knew was that it was a retelling of Little Red Riding Hood and that somehow it would meld into Cinder’s story. This book was a bit slow at first. I found myself not entirely pulled into the story, though I felt that it would get better with time, and it did. Needing to introduce a whole new cast of characters and a new setting, of course it would take a few chapters to get things rolling. However, it took a lot longer than I expected for me to really get into the story. In fact, it wasn’t until the last hundred pages that I really got into this book. It was during that last hundred pages that the book truly shined and it made up for all the slowness from before. One thing I really loved about this book was Scarlet herself. The fact that she was a farmer made me instantly love her character. It is certainly not something you see in YA books and I would honestly love to see more of them in other series. Outside of the farmer aspect, she character did feel a little flat at times, but throughout the story she did get some good charcter devolpment that made her better overall. I liked that we got a more background on Cinder and the connection that some of it had with Scarlet and her Grandmother. I have to admit though, and I’m probably one of the other people who felt this way, but I really didn’t care for Captain Thorne. I found his character annoying and I just wanted him to stop talking. Overall, I enjoyed this book. Sure it had it’s slow moments but I feel like the last bit of it completely made up for that. I would definitely recommend this series, at least up til this point, to anyone who hasn’t read it yet. I look forward to continuing the series and seeing who lies ahead for these characters and what the other characters along the way will be like. Awe, it’s a shame you didn’t like Thorne. He is one of my faves (though I will admit he does talk a lot) and it took me a little while to get used to him. He really shines in the next book I think. Yeah, it seems everyone loves him but me. I will admit I liked him a bit better in Cress, but still overall don’t like the guy. Ah well, can’t love every character in every book I suppose.